THE MESSAGES: DEVOTION TO THE MOST PRECIOUS BLOOD OF JESUS CHRIST – The Messages here is from Our Lord Jesus Christ through Bro Barnabas Nwoye to us poor sinners. This Messages are delivered to him as a result of the iniquities that filled the world and Jesus Christ of Nazareth, the man who died to save us orders us all to read these messages and meditate on his suffering for the salvation of man and also consecrate ourselves to him so that the upcoming chastisement won't have effect on us. (for us to be saved). Barnabas Nwoye's love for his Mother, Blessed Virgin Mary moved God to use him as an instrument for the salvation of poor men and for the salvation of the whole world from upcoming tribualtion. "he said, how many will survive" Jesus loves all and he come to save. May the Holy Spirit descend on anyone who read this message and may the Love of God follow him/ her all the days of his/her life. Amen. PRECIOUS BLOOD OF JESUS CHRIST, SAVES US AND THE WHOLE WORLD. The Messages here is from Our Lord Jesus Christ through Bro Barnabas Nwoye to us poor sinners. This Messages are delivered to him as a result of the iniquities that filled the world and Jesus Christ of Nazareth, the man who died to save us orders us all to read these messages and meditate on his suffering for the salvation of man and also consecrate ourselves to him so that the upcoming chastisement won't have effect on us. (for us to be saved). Barnabas Nwoye's love for his Mother, Blessed Virgin Mary moved God to use him as an instrument for the salvation of poor men and for the salvation of the whole world from upcoming tribualtion. "he said, how many will survive" Jesus loves all and he come to save. May the Holy Spirit descend on anyone who read this message and may the Love of God follow him/ her all the days of his/her life. Amen. 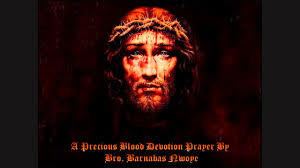 PRECIOUS BLOOD OF JESUS CHRIST, SAVES US AND THE WHOLE WORLD.